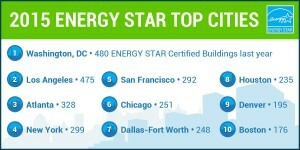 The EPA released its 2015 annual Energy Star Top 25 Cities in March. Houston earned 8th place, an improvement over the 10th place ranking Houston earned in 2014, but a far cry from 2008 when Houston ranked 3rd in the country. 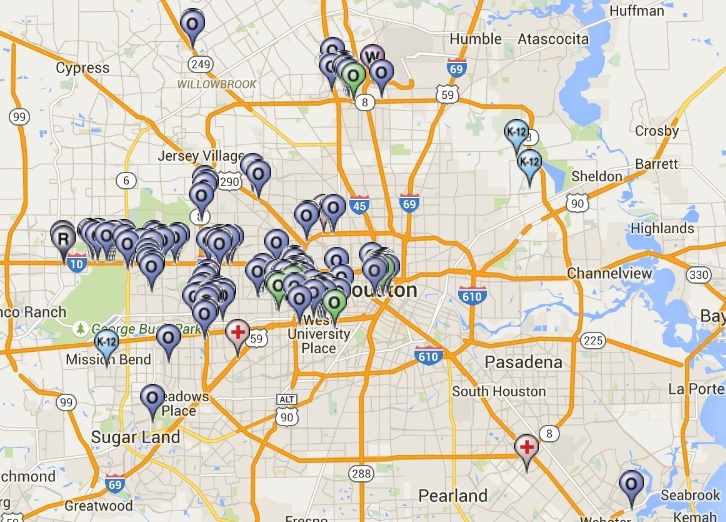 At the end of 2014, the Houston Metro area had 235 Energy Star properties measuring 86.5 million square feet. These projects saved $66.7 million, equivalent to the energy used by 62,300 homes for a year. Nationally, the big news was that the top spot went to Washington D.C for the first time ever, surpassing Los Angeles which has held the number one ranking since the EPA began issuing the Top 25 city lists in 2008. Energy Star labels are earned annually. 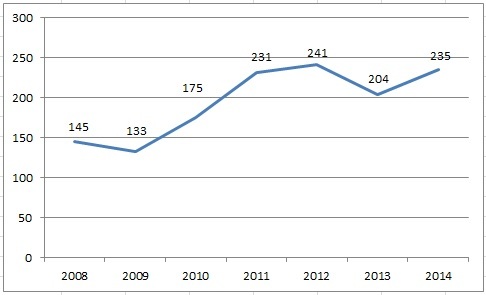 The rigor of annual certification and periodic increase in stringency results in ups and downs in the number of projects each year. Buildings are compared to projects of their same building-type (80 different types are listed from banks to worship facilities) in the Commercial Building Energy Consumption Survey or CBECS. So, a project with an Energy Star score of 77 performs better than 77% of other buildings of its same type in the U.S.. Scores over 75 are eligible for Energy Star certification. CBECS is a survey of thousands of buildings nationwide that is updated every four years by the US Department of Energy. As more efficient buildings are added to CBECS, an existing building’s Energy Star score will fall if no improvements are made. One of the strongest incentives for making improvements is a local energy policy. 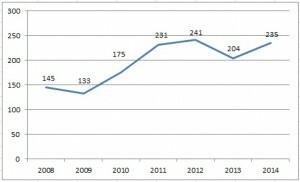 GreenBiz has an excellent article on the fact that local policy is driving this increase in Energy Star properties nationwide. 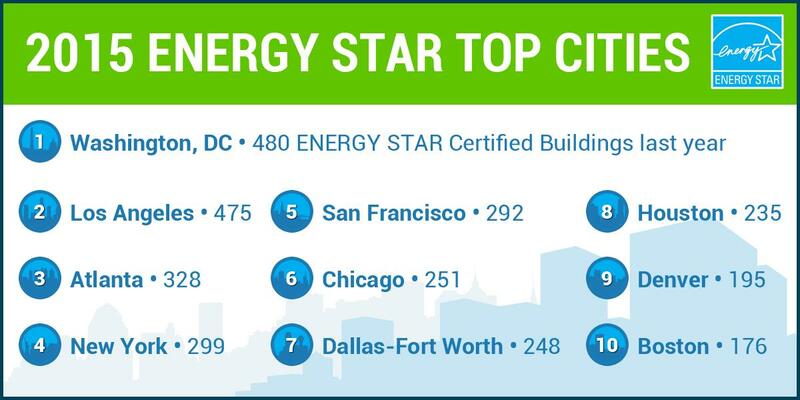 Washington D.C. has one of the most progressive policies in the US as well as demands from the GSA of only leasing Energy Star properties. Also, “Five of the 10 leading cities have passed comprehensive energy benchmarking laws and six participate in the City Energy Project”. Houston participates in the City Energy Project, but lacks any local policies affecting energy in existing buildings and has no benchmarking mandate. This has also lead to a continued slide in the rankings. Starting in third place nationally, Houston quickly settled into 7th place for three years, then fell to 10th place last year. The GreenBiz article states that several cities are creating existing building energy policies in 2015, so Houston may fall further behind. The EPA Energy Star website says that the average Energy Star property “uses 35% less energy than a comparable property”. As of March 2015, Energy Star boasted 26,261 labeled properties certifying 3.8 billion square feet. To locate Energy Star Properties, use the EPA locator.